Valentine's Day is only a few days away, and love is in the air. There are many ways to celebrate this holiday dedicated to love. You may have a hot date with your TV and a box of chocolate, or you could be planning to enjoy a bottle of wine with friends. Possibly, your day will be filled with heart-shaped balloons, flowers, or if you're really lucky — diamonds. But if you're looking to take that special someone out on a romantic date (or trying to drop a hint for someone to make some reservations) we've compiled a list of several options around the Inland Northwest to celebrate Valentine's Day. "Singles Wine & Mingle" featuring wine tastings and light snacks. Thurs, Feb. 13 from 5:30-7:30 pm. $10 at the door. SPOKANE CLUB | 1002 W. Riverside Ave.
"Valentine's Eve Dinner" features a candlelit, 5-course dinner with tables set for 2, 4, or 6 guests. Wines paired with each course have been selected by Vino's John Allen. Thurs, Feb. 13 from 6-8 pm. $75/person, tax and gratuity included. Reservations required, call 838-1229. Studio 107 and Scratch Restaurant host a 5-course dinner paired with hand-selected wines from Washington’s Rotie Cellars. Thurs, Feb. 13, at 6:30 pm. $75, reservations required. 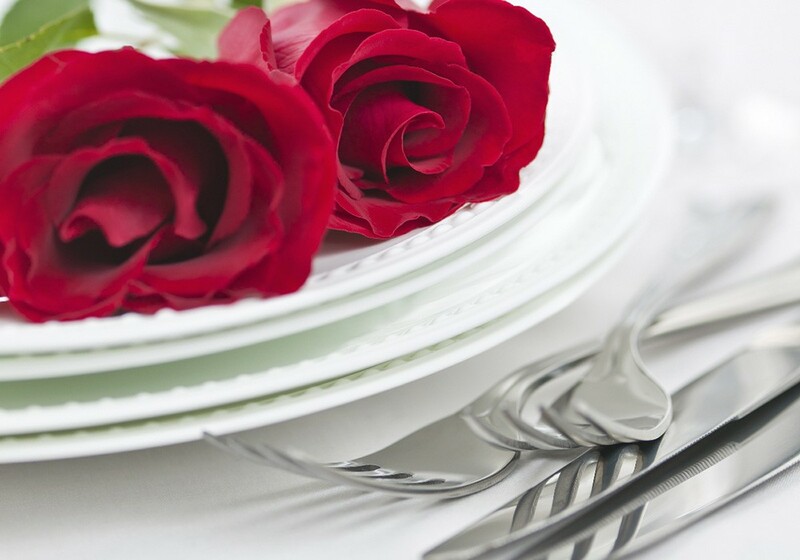 Serving a special 4-course Valentine's dinner, with the restaurant's regular menu also available. $48/person. Valentine’s Day (Feb. 14) dinner is already fully booked, but the Butcher Bar is open, first come, first served, and will be offering Sante's full dinner menu. The restaurant is offering its 3-course brunch and 5-course dinner menu from Feb. 13-15. Dinner menu includes 10 oz. sirloin, stuffed lobster, salad, soup, side and dessert, and a bottle of private label wine. $80/per couple, reservations recommended. "His & Her's Valentine's Day Dinner," featuring a 3-course meal with the option of wine pairings with each course. Seatings at 5 pm and 7 pm, reservations only. Valentine's Brewmaster Dinner, a 6-course dinner paired with beers from Trickster's Brewing Co. and Selkirk Abbey Brewing Co. Fri, Feb. 14 at 7 pm. $80/couple, reservations required. Valentine's Day at the Cellar, with a 5-course dinner by Chef Romeo Herrera and Dave Present. Fri, Feb. 14 at 7 pm, with music by Maxie Ray Mills and appetizers starting at 6 pm. Reservations only, $50/person. Valentine’s Day dinner includes the restaurant's regular menu plus specials including brazed short ribs, sole and drink specials. Valentine's menu offered Feb. 13-15. Reservations recommended. A special four-course meal is offered in addition to the restaurant's regular menu, through the weekend and on Monday as a courtesy for service industry workers. Reservations recommended. Valentine's menu served Feb. 14-17. The Connoisseur's Club hosts a 5-course dinner paired with wines from Walla Walla's Three Rivers Winery. Fri, Feb. 14 from 6-10 pm. $55/person, reservations recommended. Valentine’s Day dinner menu featuring an appetizer, starter, entree and desert for $32/person. Served Feb. 14-15. The bakery is also offering a variety of Valentine’s Day themed sweets. "Romance Night" hosted by the winery and Simply Dance studio, offering a 3-course dinner paired with wine, and Rumba dance lessons after dinner. Doors open at 6:45 pm, dinner at 7:30 and dancing at 9 pm. $120/couple. Offering a special 5-course Valentine's dinner prepared by Chef Tony. $100/couple, reservations required by noon on Thursday. Dinner menu includes soup/salad, pan-seared sea scallops, stuffed lobster tail or steak, truffle sample. $25/person. "Big Heat Dinner & Dance Fundraiser" featuring a 3-course dinner and dancing with live music by Sammy Eubanks. Doors open at 6 pm, dinner at 7 pm. $100/couple or $50/person. Luncheon hosted by Harvard Park senior living with a menu of spaghetti or bow tie pasta, salad, garlic bread, and dessert, as well as live music by The Fossils Five. Fri, Feb. 14 at 11:30 am. $15/advance, $18/door. Learn how chocolate is grown, harvested and processed, about fair trade standards and more. Fri, Feb. 14, at 6 pm. $15/person. "Rocky Horror is for Lovers," a special midnight screening of the cult classic with a shadow cast performance by Absolute Pleasure, and prop bags available for purchase. Fri, Feb. 14 at midnight. $4.50/person, tickets available to purchase all week during box office hours. "Woof, Purr & Wine" benefit dinner hosted by Partners for Pets, a Spokane Valley animal rescue organization. Includes a 3-course meal and two glasses of wine. Sat, Feb. 15, from 6-9 pm. $30/person. "Super Saturday at the MAC" features family Valentine-themed activities, the Campbell House Living History event and more. Sat, Feb. 15 from 10 am-5 pm, activities from 11 am-3 pm. Admission $3-$5. Wine tasting: sample eight red wines paired with chocolate from the Rocket's gourmet chocolate inventory. Class offered Fri, Feb. 14 [SOLD OUT] and Sat, Feb. 15 at 7 pm (only a few spots left). $20, reservations requested. Valentine's Dessert Ball, a fundraiser concert hosted by Northwest Christian School's Jazz Band, and featuring music by the local big band group Tuxedo Junction. Fri, Feb. 14 at 7 pm. $30/person or $50/couple. Valentine's Dance featuring dancing, live music by local band Variety Pak, appetizers, punch and treats. Fri, Feb. 14 from 7-10 pm. $6-$8. The market and its vendors are selling Valentine's Day gift baskets with ingredients to prepare a dinner at home, including two T-bone steaks, lobster tails, potatoes, coleslaw, wine, candy and flowers. Baskets are available for pre-pay and pick-up through Feb. 13, before 5 pm. $89.95/each. Wine Tasting: Fri, Feb. 14 (3-6:30 pm) features El Corazon of Walla Walla; Sat, Feb. 15 (2-4:30 pm) features Mackey Vineyards, also in Walla Walla. $10/tasting. The local nonprofit barbershop group is taking reservations for its singing Valentine's, to be delivered to residences, offices, hospitals and other locations. Fri, Feb. 14 from 8 am-9:30 pm, reservations required. $40, includes card, balloons and candy. We've tried to only list events that are still accepting reservations, but if you find out one of these events has filled up, please let us know by emailing cheys@inlander.com. Also send us any other Valentine's events not listed here and we'll update as needed.